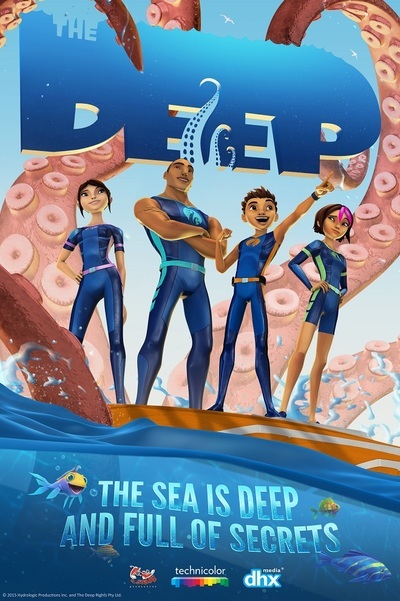 On 30 November 2015, a brand new kids TV series THE DEEP premieres on Channel 7. The story follows the adventures of the Nekton's; a family of underwater explorers. The hero-esque looking Neckton parents are Will, an oceanographer, and Kaiko, a marine biologist. Their two children are Antaeus (Ant) and Fontaine. 12 year old Ant is the fearless one, and his 15 year old sister, Fontaine, is an astute navigator. To complete the Nekton family, there is Jeffrey, Ant's pet fish. The family live aboard a submarine (the Aronnax) and explore the depths of the underwater world. THE DEEP is suitable for children around the ages of 7 to 12 years. Think of it as the next step on from children's TV show The Octonauts which airs on ABC for Kids. Both TV shows feature underwater rescue teams that go into the depths of the ocean to explore and unlock mysteries. THE DEEP TV series focuses on real species found in the ocean, and genuine facts that will educate not only your kids, but you, too. Having said that, expect to see a mix of mythical stories added to the series, which will spark the imagination of your children. Graphics used in the animation series are strikingly good, understandably due to the talent involved to create the TV show. THE DEEP is co-created and written by Tom Taylor; Melbourne based award-winning and #1 New York Times bestselling comic book author, playwright and screenwriter. Taylor has worked on some DC's Comic series Injustice: Gods Among Us and Earth-Two, Marvel's Superior Iron Man, many Star Wars works, and has recently been assigned to write the next WOLVERINE. Alongside Tom Taylor, Brisbane Illustrator and artist James Brouwer has worked with Taylor to bring THE DEEP to life. Brouwer has worked as a concept artist for big names such as the Disney Channel, Krome Studio and THQ on franchises including The Clone Wars and The Avengers. He has also illustrated comic characters such as Superman and Aquaman in the pages of Justice League Beyond for DC Comics. Taylor is the Executive Producer of the new CGI animated kids TV series THE DEEP, which is based upon his graphic novel series of the same name. Get ready for the next top TV hit show THE DEEP. Tune into Channel 7 from 30 November 2015, Monday to Friday 7.30am on 7TWO to watch the new series. THE DEEP will also broadcast on ABC3 again in 2016. Go to: www.exploringthedeep.com to find out more.